2013 was one of the quietest wildfire years in U.S. history, according to objective data from the federal government’s National Interagency Fire Center. The 47,000 wildfires last year may seem like a very large number – and it certainly gives global warming alarmists like Brown plenty of fodder for misleading global warming claims – but the 47,000 wildfires was less than half the average number of wildfires that occurred each year in the 1960s and 1970s. Importantly, the Earth was in a cooling phase during the 1960s and 1970s when so many more wildfires occurred. The 2014 wildfire season, moreover, has been relatively quiet so far. 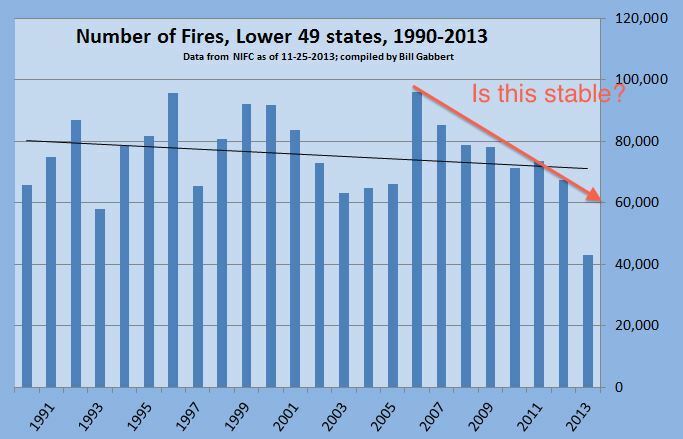 The total number of wildfires is well below the 1962-2013 average, and is even below the average for the past decade. Even so, the below-average 22,000 wildfires so far this year give global warming alarmists plenty of opportunities to mislead the public about the scientific facts. Full article is HERE Jerry Brown can invent his own political narrative but he cannot invent his own scientific facts. Update 05-28-14 In the comments Steven Frisch claimed that the number of wild fires is relatively stable? Look like they are in decline to me. If they are caused by global warming, they should be increasing. This entry was posted in California, Climate, Climate Change, Drought. Bookmark the permalink. We could have that discussion Russ but first you would need to admit that the data you posted was misleading and that the number of acres burned is increasing, regardless of cause. It is Gov Brown that is doing the misleading, he is implying that humans are responsible for global warming that is responsible for more drought, which is responsible for more fires. Which is not true. It is true that more acres have burned, but not the result of global warming, but due to forest mismanagement. We have not seen an increase in global warming in 17 years, yet CO2 continues to rise, what is the connection? While the climate alarmist Like Governor Brown press loudly proclaim that “man made climate change is to blame” for these findings the actual study is much more circumspect about what the contributors are that could be impacting the results. The authors believe contributing impacts include invasive species and consequences of past fire management practices in addition to changes in climate and in particular increasing drought severity. The study addresses large wildfires (greater than 1000 acres) in the western U.S. across nine different study defined eco-regions which have occurred since 1984. The data shows that the total regional burn area has increased by about 87,700 acres per year with an increase of 7 additional regional fires per year during this period. Did you draw that red line in yourself? I have to learn how to do that so I can misrepresent the truth as effectively as you can! Typical data cherry picking. The creator of this graph created a mean line, and the mean line shows that the numbers are, as I said, relatively stable, it went down from 80K to about 70K. But if you look at acres, the number of acres burned over the same period went from about 3 million to about 8 million. Sorry Russ, the number of wildfires is staying relatively stable, that is true, but the size, aggregate number of acres burned, and intensity of wildfires is increasing. Yet another example of cherry picking facts to only tell part, and the least important part, of a story. OK, I gave my source. What are your sources? Yes, man has change the natural cycle but it has nothing to do with CO2 or warming natural or otherwise.